Have you ever traveled down a Colorado mountain road and noticed along the roadsides there seems to be a considerable amount of trees that look sick and dying? If so, you may be seeing vegetation being adversely affected by magnesium chloride. Magnesium chloride is commonly used as a dust suppressant agent on unpaved roads in the western parts of the United States during the spring and summer. Likewise, magnesium chloride is used extensively for deicing/anti-icing on paved roads during the winter. Magnesium chloride is often used as a dust control agent since it is hygroscopic and deliquescent — it has the ability to absorb moisture from the humid air. This absorbed moisture helps limit dust by keeping the surface of the road damp enough to hold the dust particles down and reduces blow-off as fugitive dust. A primary reason why magnesium chloride is used in relatively high quantities in the Western United States is because the source is geographically local. The salty waters of the Great Salt Lake of Utah is a major source of magnesium chloride. As stated, there are numerous negatives when using magnesium chloride for dust control however, this discussion will focus on the salts impact on roadside vegetation. It has long been recognized that another salt product, sodium chloride, when used for deicing purposes has negative impacts on road side vegetation. The effect of salts on roadside soils and vegetation are well documented. Likewise, it has also been found that unpaved roadside vegetation impacted from magnesium and/or calcium chlorides applied for dust control purposes have demonstrated similar symptoms to those as sodium chloride. Even though magnesium chloride is extensively used for deicing purposes, the potential impacts of the salt on roadside soils and vegetation may be much greater when used as dust control agents. The major differences are that deicing applications are mainly done during the wintery months on paved roads, while dust control is done during the spring and summer months on unpaved roads. The timing of the dust control applications will impact the roadside vegetation differently since they are actively growing and transpiring. Also the absence of snow melt during the dust control season greatly effects the concentration and dilution of the soil salts when compared to deicers. This reduced dilution help keeps the magnesium chloride from washing far downstream with meltwater but enhances downward leaching into the soil therefore increasing the impacts on nearby vegetation. Magnesium chloride is a simple compound composed of two essential nutrients both required for plant growth, however too much of either magnesium or chloride can harm a plant. Although chloride is an essential nutrient, only very small amounts are beneficial to plants. The chloride is considered do more harm to vegetation than the magnesium. When magnesium chloride is used for dust control the pathway for chlorides to vegetation is washing/leeching off a road (mainly downslope) into the soils with rainwater or snow melt. A study done by Colorado State University has documented elevated salt concentrations between 9-foot and 320-feet from roads. Once the chloride gets into the soil it can be taken up by plant roots. When the chloride gets into a plant, it moves up the water-conducting system and accumulates at the margins of leaves or conifer needles. This is where die-back occurs first. At high chloride concentrations, damaged trees may be evident after two years of treatment. Research has shown that injury can occur when the needle/leaf chloride content reaches 5,000- ppm (dry weight) in conifer trees and 10,000-ppm to deciduous species. This may sound like a lot of chloride but it may not be on a roadside that was treated with magnesium chloride. For example, if you apply 1⁄2-gallon of a 30% solution of a magnesium chloride solution, you are applying approximately 1.2-pounds or 544,311 milligrams of chloride per square yard of road. The amount of chloride is staggering when a typical one-time application of magnesium chloride may contribute 11,358 pounds of chloride per mile on a 16’ wide road! Obviously roads treated more than once a year will greatly increase the chloride concentration. And since magnesium chloride is highly water soluble, 54,200 milligrams per liter, it is easy to understand why it can leach and run-off a treated road so easily. While the ease of availability and the lower cost of magnesium chloride maybe attractive, the long-term environmental impact is significant. 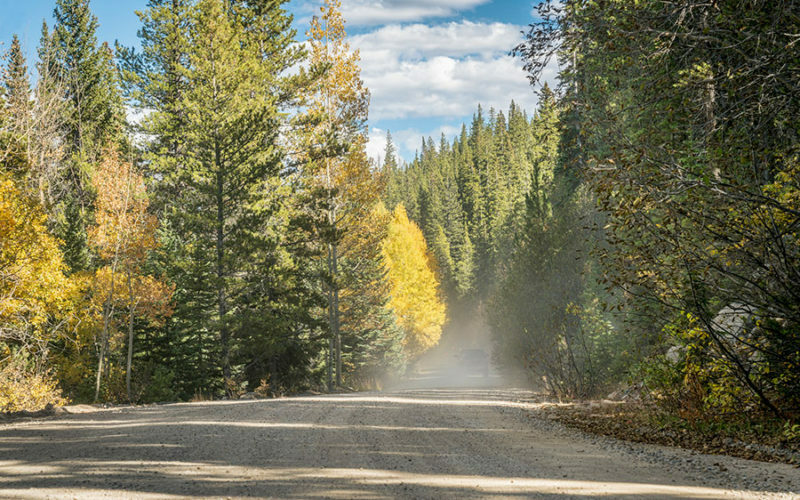 Products such as Earthbind® 100 for dust control can significantly reduce dust from unpaved roads while being environmentally friendly. Earthbind, once cured, is not water-soluble and stays in the road bed and can improve the road base with each application. Learn more about how you can control dust without killing roadside vegetation with Earthbind® 100.